Title The / Holy Bible, / Translated from / The Latin Vulgate: / Dligently Compared / with the Hebrew, Greek, and Other Editions in Diverse Languages. 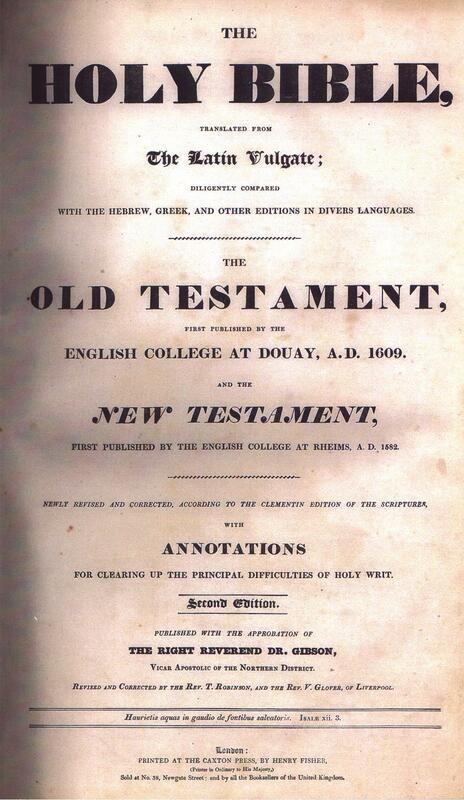 / the / Old Testament, / First Published by the / English College at Douay, Anno 1609. /and the / New Testament, / First Published by the English College at Rheims, A.D. 1582. / Newly Revised and Corrected, According to the Clementin Edition of the Scriptures. / with / Annotations / for Clearing Up the Principal Difficulties of / Holy Writ. / Second Edition. / Published with the Approbation of / The Right Reverend Dr. Gibson, / Vicar Apostolic of the Northern District. / Revised and Corrected by the Rev. T. Robinson, and the Rev. V. Glover, of Liverpool. / London: / Printed at the Caxton Press, by Henry Fisher, / (Printer in Ordinary to His Majesty,) / Sold at No. 38, Newgate Street: and by All the Booksellers of the United Kingdom. Comments The Second Edition in this series. Title The / Holy Bible, / Translated from / The Latin Vulgate: / Dligently Compared / with the Hebrew, Greek, and Other Editions in Diverse Languages. 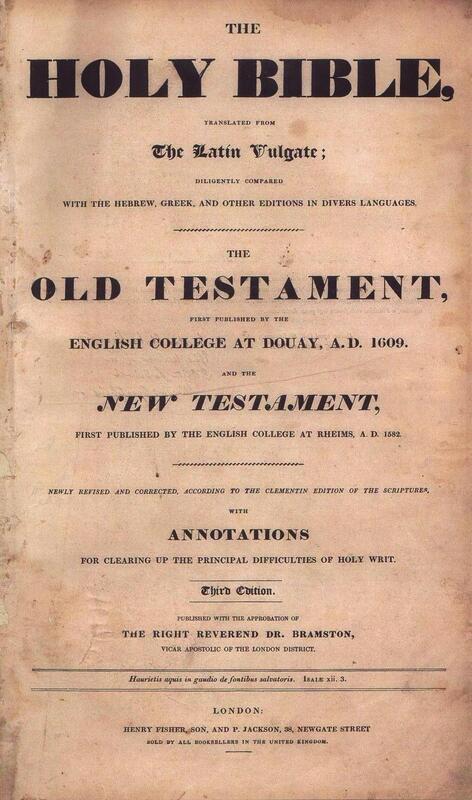 / the / Old Testament, / First Published by the / English College at Douay, Anno 1609. /and the / New Testament, / First Published by the English College at Rheims, A.D. 1582. / Newly Revised and Corrected, According to the Clementin Edition of the Scriptures. / with / Annotations / for Clearing Up the Principal Difficulties of / Holy Writ. / Third Edition. / Published with the Approbation of / The Right Reverend Dr. Bramston, / Vicar Apostolic of the London District. / London: / Henry Fisher, Son, and P. Jackson, 38, Newgate Street / Sold by All the Booksellers in the United Kingdom. Comments The Third Edition in this series.